Wire manipulation takes many forms in jewelry-making. A necklace and pendant design can be enhanced with handmade wire components that include a formed clasp, pendant hanger and bead cage. Work with soft tempered wire to minimize the risk of overworking the wire. 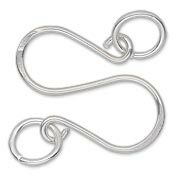 Using the flush-cutters, cut a 3-inch piece of 18- or 20-gauge dead-soft sterling silver wire. Using the tip of the round-nose pliers, form a small loop on one end of the wire. Using the chain-nose pliers, close the circle. Place the wire on the barrel of the 8mm jumpring mandrel having the loop resting just above the barrel coming up toward you. Rotate the mandrel away from you, forming a shepherd's hook. Place the wire on the barrel so the small loop is parallel to the mandrel. Bend the wire around the mandrel, forming the second loop, formed in the opposite direction of the first, creating the S-shape. Using the round-nose pliers, finish the component with a small circle on the remaining straight end of the wire as you did in Step 1. Using flush-cutters, trim any excess wire. Note: Forming both curves on the 8mm barrel of the mandrel will make them symmetrical. Use the variety of barrel sizes on this mandrel for an asymmetrical shape. Place the wire form on the steel block. Using a light touch with the ball peen hammer, hammer the curves of the clasp to strengthen. Hammer with more force to flatten the curves for a different finished look. Use a polishing cloth to bring up the shine of the wire. Cross the wire over itself before removing from the hammer handle or dowel, leaving about a 1-inch length of straight wire at each end for spiralling. Using round-nose pliers, begin a spiral at one end. Using chain-nose pliers, continue to spiral the wire up to the crossover. Repeat for the other end of wire. To strengthen the pendant hangar and give some texture to the wire, place the component on a steel bench block sitting on the rubber block (for noise absorption). Hammer with the round side of the ball peen hammer all along the length of wire up to the end spirals. After hammering, finish with a polishing cloth to bring up the shine. 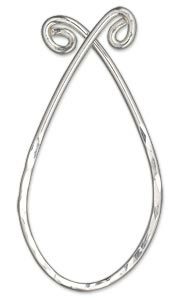 Using flush-cutters, cut a 7-inch length of 18-gauge sterling silver dead-soft round wire. This is enough wire to encircle a 10mm bead; a larger bead size will require a longer length of wire. Form double spirals on this wire with one spiral formed on the top side of the wire and the second spiral formed on the bottom side of the wire. Fold the double spiralled wire in half so that the spirals meet each other. Using round-nose pliers, begin pushing up and pulling out the rounds of wire to form a barrel shape, working one spiral and then the other. Gently open the center ring of the barrel and insert the 10mm bead. Compress the rings of the barrel to close it. The wire caged bead is now ready to be strung in a necklace design. 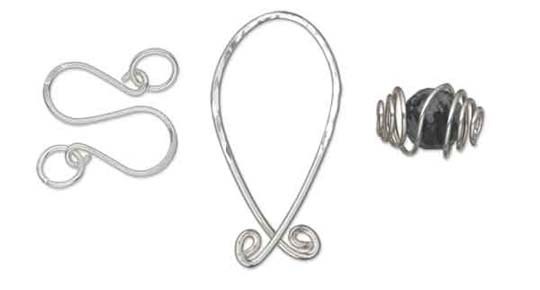 Optional: Form a simple loop on a 2-inch piece of 18-gauge sterling silver wire. Thread the wire through the cage and bead hole, come out the other side and turn a similar simple loop. This type of bead cage makes a great earring dangle or chain component.